Jeb Bush took a swipe at the extremists in the GOP. “Ronald Reagan would have, based on his record of finding accommodation, finding some degree of common ground, similar to my dad, they would have had a hard time if you define the Republican Party — and I don’t — as having an orthodoxy that doesn’t allow for disagreement,” Mr. Bush said at question-and-answer session with reporters and editors held Monday morning in Manhattan by Bloomberg View. The Democrats are just as entrenched in ideology. Informed Not Inflamed Take: Arguing degrees of extremism is useless, but I think the GOP is more entrenched. He cites one of the biggest failures for both sides: adhering to the Simpson-Bowles plan. Informed Not Inflamed Take: YES! 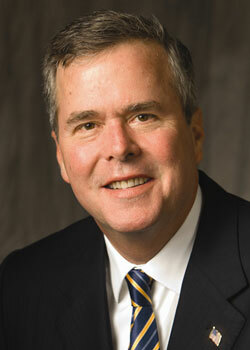 Granted, Jeb may be prepping for a run in 2016. It’s nice to see common sense is part of his platform. Did you hear any of what he just said during those silly debates earlier this year? So, again. Here, here, Jeb. If you see this mentioned on Fox News, and I miss it, let me know. An entertainer on FNC mentioning this — with any positive slant — would be big news. The overall reaction to Jeb Bush will be something to watch. We may start seeing a decrease in political extremism. That would be welcome before Taxmeggedon at year’s end when the budget bomb explodes. Previous post: The Economy is Fine? The Media Bias. Please!!! !